Acer once again brought the party of the year to PAX East! 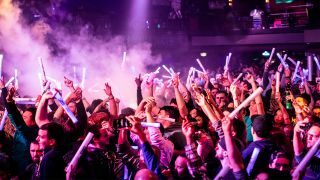 Getting the word out with the help of PC Gamer and GamesRadar, the Acer Predator After Party filled Boston's Royale Nightclub with PAX attendees from all around the world. The event gave guests, press, and VIPs the chance to grab a drink and check out the latest gaming hardware from the Acer Predator line. But before the party even started, PAX-goers were able to interact with cosplayer Stella Chuu and her entourage as they scoured the PAX East show floor interacting with attendees, taking pictures in her custom Acer Predator costume, and giving away swag. One lucky winner received a Nitro 5 laptop by following #PredatorPAX, locating Stella based on her tweets, and calling out the secret code word. Stella's cosplay was themed in the Predator Disruption colors and was built on her livestream prior to the event. The After Party itself was a blast! Attendees grabbed drinks, took pictures at the photo booth had a chance to play games on Acer Predator hardware like the Predator Orion 9000 desktop and Predator 21X notebook. The night kicked off with a welcome from the host and shoutcaster Mooshu followed by two DJ performances on the flashy nightclub stage. Guests danced all night as headliner DJ Arty closed out the party with a full 2 hour set. Those who stayed for the entire party had many opportunities to upgrade their gaming setup. Acer awarded coveted gaming products throughout the night to those who entered and won our social giveaway by sending a tweet of the party to #PredatorPAX. The lucky winners walked away with prizes that included the Nitro 5, Helios 300 and Triton 700 gaming laptops. A big thank you to all who came out to the Acer Predator After Party! We'll see you at next year's PAX East!